WHO : On the index finger, radial to the distal phalanx, 0.1 F-cun proximal-lateral to the radial corner of the index fingernail, at the intersection of the vertical line of the radial border of the fingernail and the horizontal line of the base of the index fingernail. WHO : On the index finger, in the depression distal to the radial side of the second metacarpophalangeal joint, at the border between the red and white flesh. 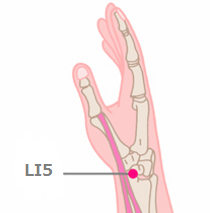 Practical :On the index finger, get a point at end of the striated lines of the proximal interphalangeal joint. WHO : On the dorsum of the hand, in the depression radial and proximal to the second metacarpophalangeal joint. Practical :On the index finger, get a point at end of the striated lines of the metacarpo phalangeal joint. WHO : On the dorsum of the hand, radial to the midpoint of the second metacarpal bone. WHO : On the posterolateral aspect of the wrist, at the radial side of the dorsal wrist crease, distal to the radial styloid process, in the depression of the anatomical snuffbox. Note : The depression of the anatomical snuffbox is formed when the thumb is fully abducted and extended between the tendons of the extensor pollicis longus and the extensor pollicis brevis. 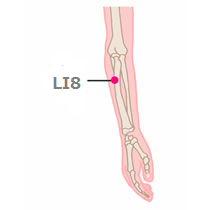 WHO : On the posterolateral aspect of the forearm, on the line connecting LI5 with LI11, 3 Bcun superior to the dorsal wrist crease. 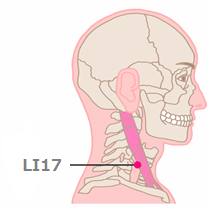 Note: LI6 is located at the junction of the upper three fourths and the lower one fourth of the line connecting LI5 with LI11. Practical : Overlap the both hands by crossing the thumbs. 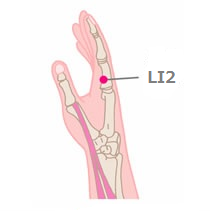 The tip point of the index finger is LU7. 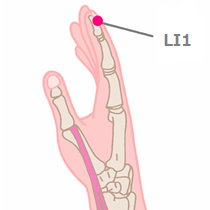 However, the tip point of the middle finger could be used as LU6. 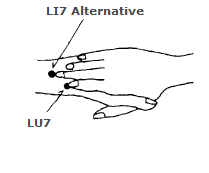 WHO : On the posterolateral aspect of the forearm, on the line connecting LI5 with LI11, 5 Bcun superior to the dorsal wrist crease. 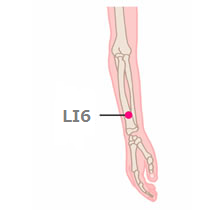 WHO : On the posterolateral aspect of the forearm, on the line connecting LI5 with LI11, 4 Bcun inferior to the cubital crease. 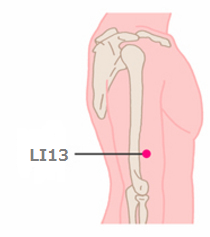 Note: LI8 is located at the junction of the upper one third and lower two thirds of the line connecting LI5 with LI11, 1 B-cun inferior to LI9. 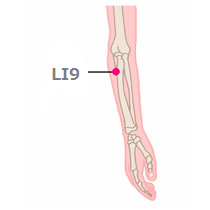 WHO : On the posterolateral aspect of the forearm, on the line connecting LI5 with LI11, 3 Bcun inferior to the cubital crease. 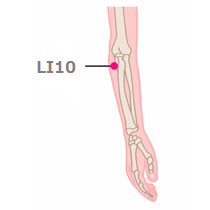 WHO : On the posterolateral aspect of the forearm, on the line connecting LI5 with LI11, 2 Bcun inferior to the cubital crease. WHO : On the lateral aspect of the elbow, at the midpoint of the line connecting LU5 with the lateral epicondyle of the humerus. 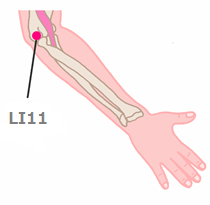 Note: When the elbow is fully flexed, LI11 is located in the depression on the lateral end of the cubital crease. 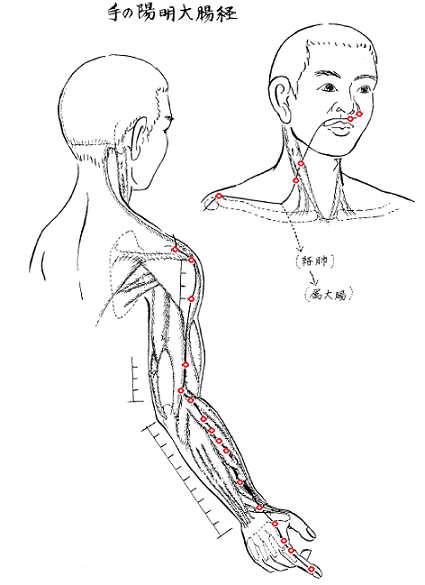 Practical : Make Gassho（合掌） with both palms and with this angle, get a point in the end of the cubital crease. WHO : On the posterolateral aspect of the elbow, superior to the lateral epicondyle of the humerus, anterior to the lateral supraepicondylar ridge. 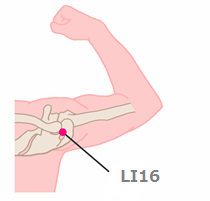 Practical : Bend the elbow and find the middle point of the connected line of LI10 and LI15. 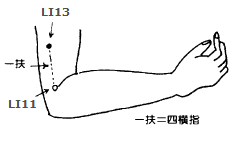 WHO : On the lateral aspect of the arm, on the line connecting LI11 with LI15, 3 B-cun superior to the cubital crease. 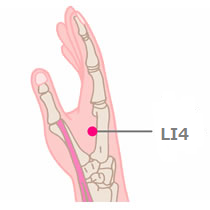 Practical : 4 fingers up from LI11. Use for : Arm problems. One of the best Moxa points for eye diseases and problems same as LI-4, LI-11. Needling deeply may not appropriate. 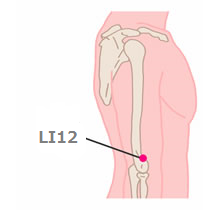 WHO : On the lateral aspect of the arm, just anterior to the border of the deltoid muscle, 7 B-cun superior to LI11. 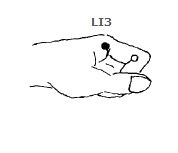 Practical : 4 fingers down from LI-15. WHO : On the shoulder girdle, in the depression between the anterior end of lateral border of the acromion and the greater tubercle of the humerus. Note: When the arm is abducted, two depressions appear, anterior and posterior to the acromion. 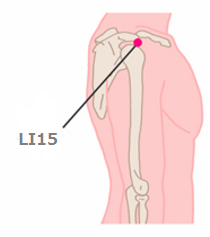 LI15 is located in the deeper depression anterior to the acromion. 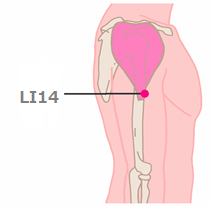 TE14 is located in the posterior depression. WHO : On the shoulder girdle, in the depression between the acromial end of the clavicle and the spine of the scapula. Note: In the depression between the two bones lateral to the suprascapular fossa. WHO : On the anterior aspect of the neck, at the same level as the cricoid cartilage, just posterior to the border of the sternocleidomastoid muscle. 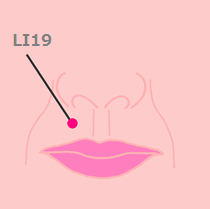 Note: Directly inferior to LI18, at the same level as ST10. Practical : Bend neck opposite side, touch clavicle and sternocleidomastoid muscle trailing edge by pinky finger then touch sternocleidomastoid by other 4 fingers. 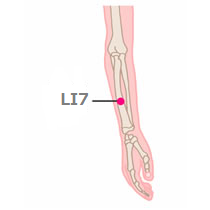 The points where middle finger touched is LI17. 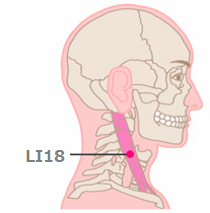 WHO : On the anterior aspect of the neck, at the same level as the superior border of the thyroid cartilage, between the anterior and posterior borders of the sternocleidomastoid muscle. Practical : Bend neck opposite side, touch clavicle and sternocleidomastoid muscle trailing edge by pinky finger then touch sternocleidomastoid by other 4 fingers. 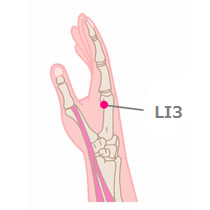 The points where index finger finger touched is LI18. WHO : On the face, at the same level as the midpoint of the philtrum, inferior to the lateral margin of the nostril. Note: 0.5 B-cun laterals to GV 26. 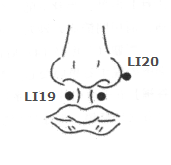 Remarks: Alternative location for LI19 – On the face, at the same level as the junction of the upper one third and lower two thirds of the philtrum, inferior to the lateral margin of the nostril. WHO : On the face, in the nasolabial sulcus, at the same level as the midpoint of lateral border of the ala of the nose. 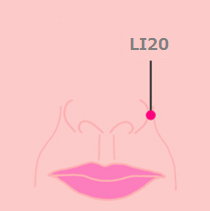 Remarks: Alternative location for LI20 – On the face, in the nasolabial sulcus, at the level of the inferior border of the ala of the nose.